A pure biketrials technique, the "roll-up" will take you up any gnarly rocks and odd shapes, without a lot of run up distance and with virtually no effort. It takes a lot of synchronization between body language and pedalling action to perform an efficient weight transfer over the front wheel as it rolls smoothly up the obstacle. 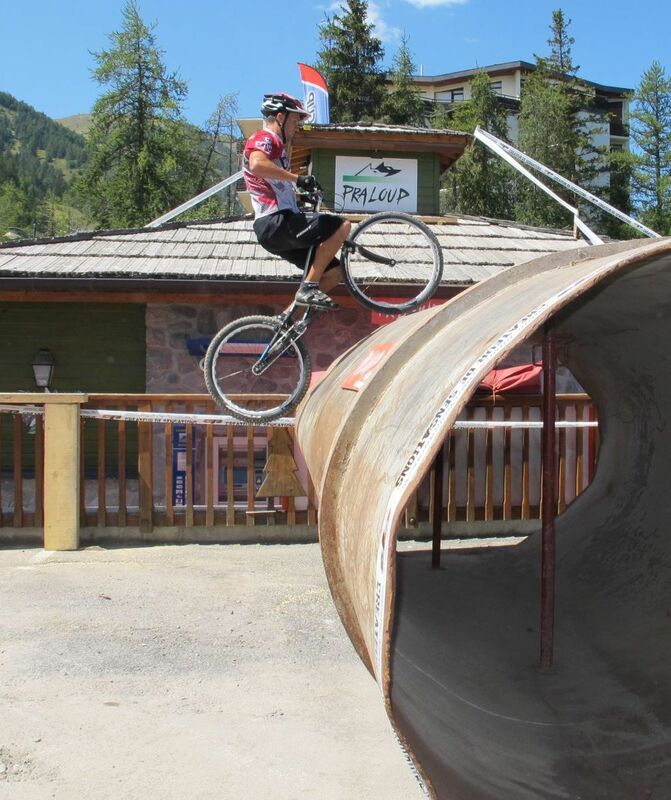 Andrei Burton on his way up a large industrial pipe. Some obstacles will require more momentum (hence more speed), but to learn this technique, you can start at about one full crank turn from a small step, on your good pedal. Push firmly on the driving pedal for the first quarter turn to control your speed of approach and crouch to prepare for a push-up and a jump impulse. Use the next quarter turn to lift the front wheel up to the edge of the obstacle, pushing on your lazy foot in a controlled manner. You must aim the front wheel right at the edge, not behind. As the front wheel takes off, keep your knees and arms slightly flexed, ready to give the full jump impulse as the front tyre reaches the edge of the obstacle. Finish the crank turn in full extension on your good pedal again, thrusting your shoulders over the bars from the highest position on your front pedal. 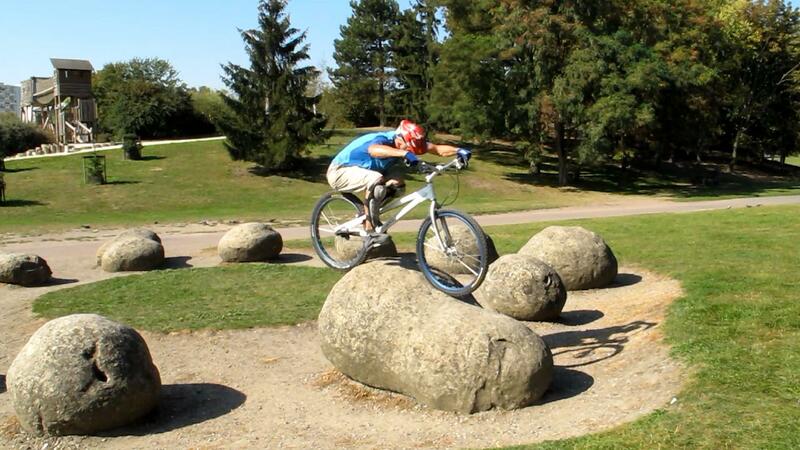 Maintain the pressure on the front wheel to roll it over the obstacle, with your shoulders leaning forward. This tilts the bike forward and helps you lift the rear wheel up. 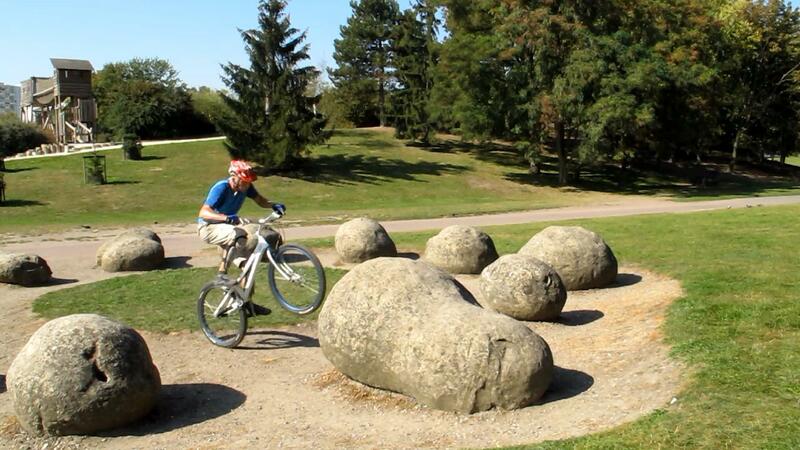 Let the rear wheel take-off by tucking slightly and push on the handlebars to roll the bike further on the obstacle. Only use the front brake once you have secured enough grip on the obstacle with both wheels. 1° Push firmly on the driving pedal for the first quarter turn to control your speed, crouch to prepare for a push-up and a jump impulse. 2° Use the next quarter turn to lift the front wheel up to the edge of the obstacle, pushing on your lazy foot in a controlled manner. 3° Aim the front wheel right at the edge but stay fairly low until you accelerate, thrusting your hips up as you jump on top of your strong foot. 4° Finish the crank turn in full extension on your good pedal again, thrusting your shoulders over the bars from the highest position on the pedal. 6° Help the rear wheel take-off further by tucking slightly and pushing on the handlebars to roll the bike further on the obstacle. Nicolas Vuillermot tries to get as much grip as possible. Abel Mustieles secures both wheels after rolling up. 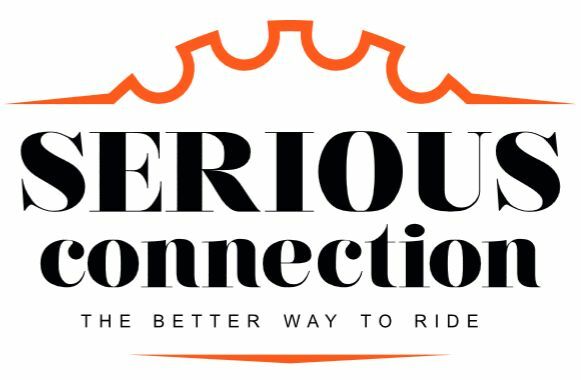 When fully exploited by top riders, the roll-up technique is an amazingly smooth move. Depending on the obstacle, the real trick is to figure out a line and identify a virtual slope along which to lift the front wheel and thrust your body up. Although it is counter-intuitive and it may feel odd, you should really force yourself to lift the front wheel only when pushing on your lazy foot, so that when the front wheel actually reaches the edge of the obstacle, you end up on your strong foot ready for an impulse. This will bring you in the correct position so that you can throw your shoulders over the bars and ease the rear wheel after your extension. If the move is performed correctly with enough momentum forward, you can roll directly on the front wheel and clear the edge of the obstacle without bumping the rear wheel into it. 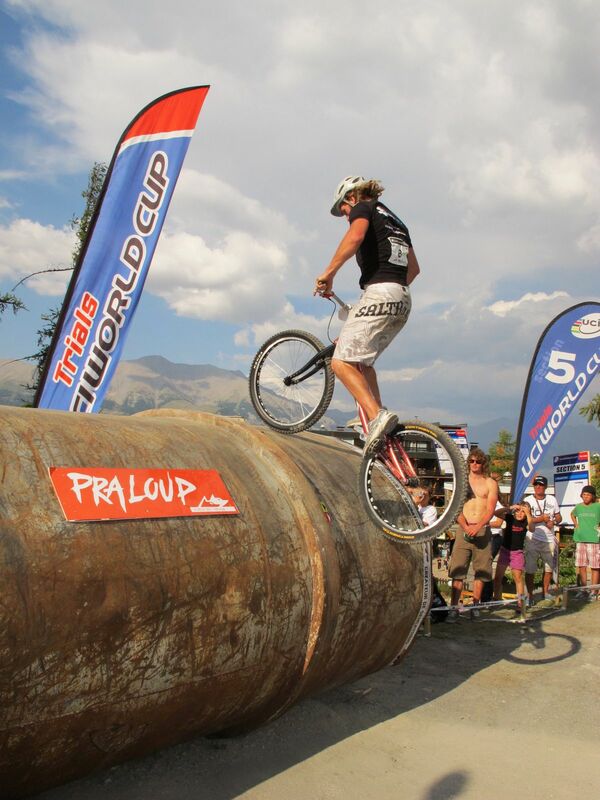 Aurelien Fontenoy jumps to roll-up on the front wheel. 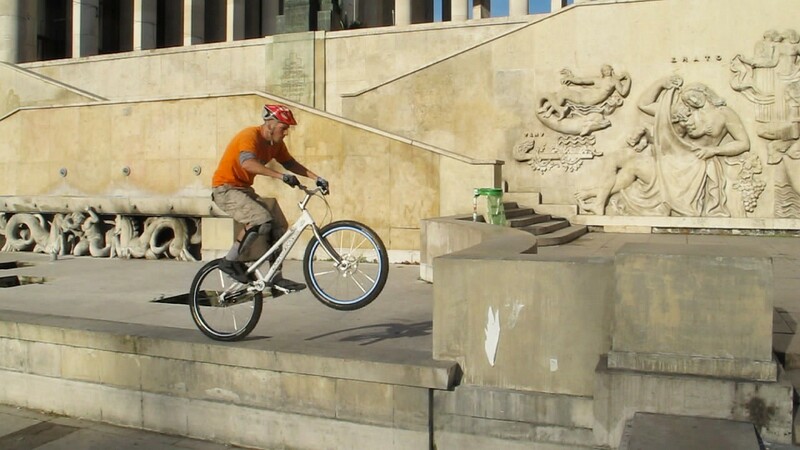 When the obstacle is too high for just feathering the edge of the wall with the front wheel, then the roll-up technique can be pushed to its limit by giving a strong impulse in your front pedal just before take-off, throwing your shoulders and body weight over the bars even before the front wheel reaches the obstacle. 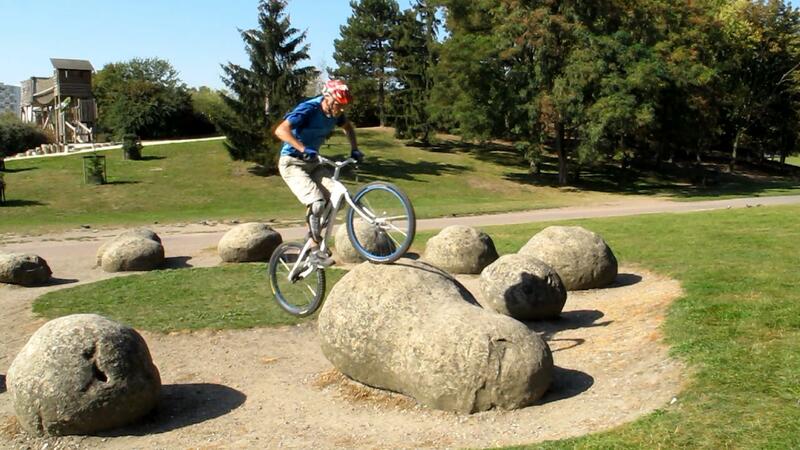 This also works on very steep but rounded obstacles such as large boulders, cable reels, concrete pipes where you will be able to secure some grip with the rear wheel only if you roll high enough. 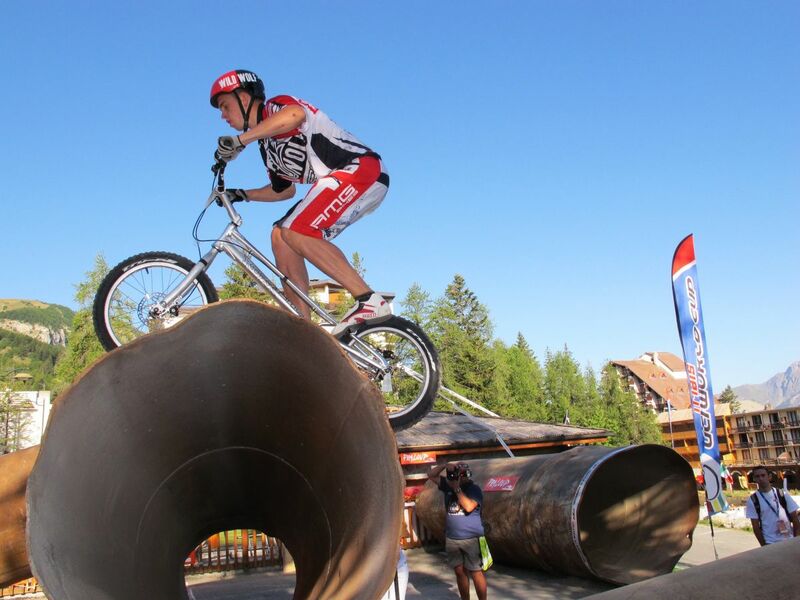 You end up in mid-air, with the front wheel above the upper edge of the obstacle. Use your own momentum to pull the bike up over the edge. If you overdo it, you just end up rolling in balance on the front wheel. In some rare occasions, you may be able to use a little bump in your run up track to pull a bunny hop and carry on in a roll-up fashion farther than if you just landed on the rear wheel. 1° Lift the front wheel up as you approach the obstacle, pushing on your lazy foot as you prepare to accelerate and surge forward. 2° Aim the front wheel at the top and finish your jump impulse with the front wheel hovering past the upper edge of the obstacle. 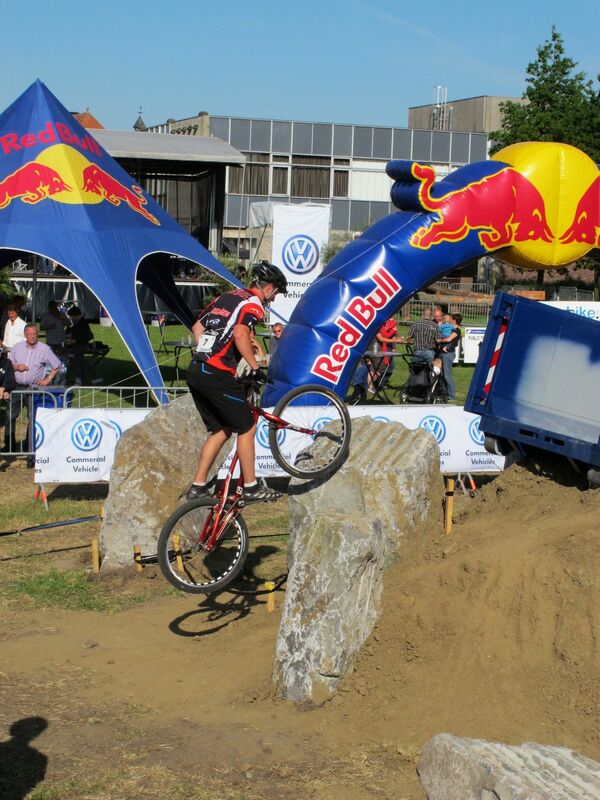 3° You end up in mid-air, with the front wheel rolling over the upper edge of the obstacle. Use your momentum to pull the bike up. 4° Maintain the pressure on the front wheel to roll further until you have secured both wheels onto the obstacle.